Jillian and ex-husband Chad are enjoying a play at a local community theater when a scream interrupts the production upon discovery of a bludgeoned volunteer. 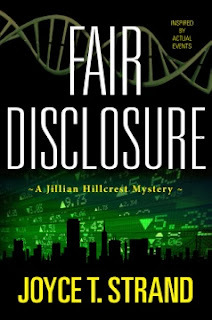 When it turns out that the victim is someone Jillian interviewed for a job at her company, she becomes involved in another crime, drawn ever deeper by a second murder, an irate investor, the participation of law enforcement amateurs, an increasingly unreliable assistant, and suspicious trading of her company’s stock. Meanwhile, Chad is pressuring Jillian to say “yes” to a second marriage. Inspired by a networking expert firm in the San Francisco Bay Area involved with a large hedge fund that exploited insider trading through a nation-wide network. 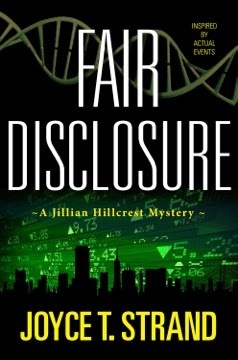 FAIR DISCLOSURE is a who-done-it mystery set in the business environment and investor greed. I enjoyed writing the following excerpt to define my protagonist, Jillian Hillcrest, the publicist sleuth who solves the mystery—despite her best efforts to simply fulfill her job responsibilities. In the excerpt, her ex-husband Chad proposes to her hoping to re-marry, given the couple’s rejuvenating relationship caused by recent events. He presents his proposal with humor and a touch of endearment, and we understand Jillian's character through his eyes. Chad smiled when he remembered the afternoon that he had proposed to Jillian—for the second time. …They had driven two hours south to Monterey to spend a weekend together. They had been there many times, because both of them enjoyed visiting the aquarium, walking on the wharf, dining at one of the many great restaurants in the area, and just soaking in the beauty of the small town by the bay. The couple had walked out on the wharf, and the sea lions seemed lazier than usual lying around the pilings and occasionally barking. The sea gulls brazenly landed on the pier, begging for food, and squawking. The day was idyllic—just right for a proposal with sunshine, blue sky, and calm bay. The smells of clam chowder, cotton candy, sautéed garlic, and other unidentifiable aromas from the nearby restaurants completed the ambience. It couldn’t have been more perfect. Chad was wearing his derby hat, long-sleeved white shirt, and black gabardine vest and jeans. He had planned his wardrobe meticulously. His hats were an important part of his personality, representing his sense of humor, which Jillian appreciated and encouraged. He designed the rest of his outfit to show that although he liked to laugh, there was more to him, and much more to give. When she stopped to admire the ocean view, he did indeed get down on one knee, not an easy task for the lanky, more-than-six foot Chad. Although startled, Jillian just rolled her eyes, accustomed to his often-outrageous behavior to make her laugh. He removed his hat and looked up at her with big hazel eyes and pouting lips. From his inside vest pocket, he pulled a package that was bigger than a ring case. Jillian looked down at him, accepted the package, and pushed him down as he tried to stand up. She was enjoying the spectacle. She opened the package, which was wrapped in aluminum foil, another reason she made him stay on his knee. Who proposed with a package wrapped in aluminum foil? She first came across a key, which she assumed was to his house in Alameda. When she asked, “Alameda?” however, he shook his head. Brynn was Jillian’s boss, but only for a few more weeks. She was the Chief Financial Officer (CFO) at Harmonia, and she and her soon-to-be-ex-husband, Liam, had purchased a winery northwest of Sonoma. Jillian and Chad had stayed in the cottage at the winery for the week following Jillian’s kidnapping. Then she came to the ring. It wasn’t a diamond. Rather it was a deep purple amethyst—her birthstone—set in platinum silver. It was striking. “Chad, it’s exquisite. And regardless of whether I marry you or not, I plan to keep it forever. It’s beautiful.” She put it on the ring finger of her left hand. Almost everyone within earshot started laughing. Jillian simply bit her lip, shook her dark hair off her face, slowly stretched, and yawned—creating additional laughter from the appreciative on-lookers.